That one’s as fishy as a barrel of mackerel. That was first published in 1985. That in turn seems to be based on something published in 1973 — World Buddhism, Volume 22 — by the World Fellowship of Buddhists. This is clearly not the Buddha who is supposed to be speaking, but simply a hypothetical meditator. It would have been better also to have reverted to the traditional “greed, hatred, and delusion” that World Buddhism used, especially given that the Buddha was hardly immune to sickness, and in fact died of food poisoning. Food poisoning is NOT sickness. Sickness, or perhaps illness, is something that happens due to various imbalances in mind, body and spirit. Food poisoning is not a sickness like malaria, T.B., or pneumonia. Can you explain why you have made this incorrect assertion? I’m not at all clear what point you’re trying to make. Food poisoning is the result of ingesting harmful bacteria, such as salmonella sp. It’s therefore an infectious disease in the same way as tuberculosis or pneumonia. Malaria is of course a parasitic infection, but still an infection. The scriptures describe Buddha getting ill on several occasions. At one time his personal physician diagnosed that his “humors” were out of balance, and prescribed various purgatives. Another time the Buddha was “gravely ill” and had a disciple recite the Dhamma as his treatment. 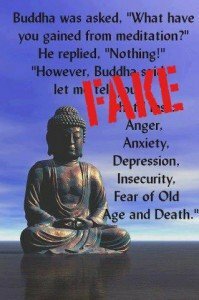 Are you trying to assert that the Buddha did not in fact get ill? If so, you have a very peculiar view of the kind of person he was, and of the nature of spiritual awakening. Below is one of the question from King Milinda (2nd Century BCE) and the answer from Enlightened Nagasena Thero. There is a series of questions from King Milinda and answers from Enlightened Nagasena Thero. King Milinda; Dear thero, Lord Buddha preached that the alms given just before the attaining Buddha hood and alms given before he faces the Nibbana, give most fruitful results to the giver than other givings. But monk Sangeethikaraka, has said that after having the last alms giving by Chunda Karmaraputhra, L.Buddha got sick severely. So thero, how can Chunda Karmaraputhra collects more fruitful results after making the L.Buddha sick…? Enlightened Nagasena thero; Dear king, both sayings are correct but you have wrong understanding. L.Buddha’s last meal was not prepared only by C.Karmaraputhra, but also ‘Devas’ from more luxurious worlds also added their alms it knowing the fruitful result of it. L.Buddha never got sick because of his last meal, but at the last moment he bears his body, it got more weaken as a result of L.Buddha’s decision to face the Nibbana. I’m afraid that strikes me as a rather weak argument from Nagasena. “Now, Kalamas, don’t go by reports, by legends, by traditions, by scripture, by logical conjecture, by inference, by analogies, by agreement through pondering views, by probability, or by the thought, ‘This contemplative is our teacher.’ When you know for yourselves that, ‘These qualities are skillful; these qualities are blameless; these qualities are praised by the wise; these qualities, when adopted & carried out, lead to welfare & to happiness’ — then you should enter & remain in them”. I copied it form your own website. The Buddha Dharma (Teaching) has the characteristic of ‘Sandittika’ means come see and investigate it yourselves. Don’t believe just as Buddha has preached. Buddhism is preached by a MAN who was born in this earth. not from a god or son of god what so ever. Furthermore Lord Buddha states that any religion which teaches the 4 Noble Truths and the Noble 8 fold paths, is a right religion to follow. Buddhism teach something which is achievable in this very life by us. The levels of concentration of mind (Dyaana) is achievable in this very life through Buddhist Meditation. A person how has ended Craving, Hate and Ignorance and achieved Dyaana such as Sotapanna, Sakurdagami, Anagami, Arhat and the Buddhahood wouldn’t go around and showoff that they have achieved Dyaana. It can only be found out by a person who has achieved the same or above level. Enlightened Nagasena Thero was a Buddhist Monk who had become Arhat. a certain person has a high power of mind and also ‘Irdi’ (supernatural) powers. Me and you both are lay people. But those levels of concentration of mind and Irdi powers can be achievable by both of us in this very life if we follow the right path. There for condemning a statement of someone who had higher levels of concentration of mind by a lay person can not be acceptable. I would only have accepted your statement condemning the Enlightened (Arhat) Nagasena Theros statement only if you were an Arhat Buddhist Monk or a Buddha. Do you know where that one comes from? Quick research seems to suggest Huang-Po. Chapter 22 of the Diamond Sutra? It’s certainly similar, although the topic is Enlightenment rather than meditation. That’s from the Diamond Sutra, or at least from a very old translation of that text. More modern translations express that verse rather differently, which may mean that they’re better translations or that there are variants. I’m afraid I’m not qualified to know! Your website is fake, either u may be christian, muslim or hindu? So u are presenting hateful writings. I’m confused. Why do you think that my letting people know about misattributed quotes is hateful? Huang Po reiterates this quote from the Buddha a few times in the book. Thanks for that. The Heart Sutra too makes the point that there is no attainment. However, riven the very different content of the rest of the two suspect quote, I suspect that the resemblance to the Prajnaparamita literature is coincidental.